As a business owner, you don’t have to be overly conscious of your environmental footprint to be interested in an electric car charging station. Recently, this amenity has started to become regarded as a definite perk over other businesses. As a small business, you have a definite advantage over your big corporate competitors in that you don’t have to run a decision past six or seven different people to get it approved, you can just decide. That means that small businesses are leading the way on turning the charging stations into a common amenity that their customers can enjoy. All over the Eastern United States small businesses are investing in electric car charging spaces for their parking lots. While some business owners don’t think it’s worth the $5,000 to $6,000 initial cost to install the item, other business owners have found that on average an electric charging station starts by extending the customer dwell time by another 50 minutes. By itself, that’s quite a bit of time for each customer to spend more money. Interestingly though, most of the business owners who install one of these electrical stations are not interested in an immediate return on investment, they’re more interested in gaining their customer’s loyalty. While just selling electricity through this station will hardly pay off your investment immediately, the repeat customers will. If you’re a fan of Tesla’s hyperloop, then you’re no stranger to the idea of privatized infrastructure. Whether or not you’re a fan of the idea of private companies becoming involved with infrastructure, it is still an interesting idea. While the private sector has certainly driven up the price of airfare, the Hyperloop and electrical stations that might eventually power cars everywhere are something else. As a small business owner, getting on top of this trend now could prove very lucrative for your business. One of the most beneficial portions of the idea is the loyalty it will inspire in your current and new customers. Marin County is known for our natural beauty and liberal politics that lean toward progressive ways to save our own beautiful environment. Catering to people who believe in these same standards fosters a powerful sense of loyalty and community that would not only be good for the prosperity of your small business but also the environment. Worried that the Marin County community won’t find your EV charging stations? Don’t be. There are online communities that let people know where they can charge up when they’re in a pinch, like the app, PlugShare. You’ll have the option to list your electrical charging stations there, which will effectively drive traffic to your business that will utilize your services and the charging station they came for. 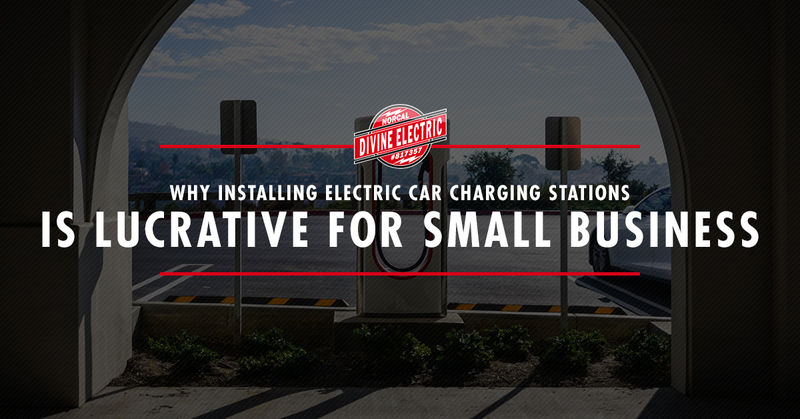 Here at Divine Electric Nocal, we are proudly making EV stations available to the people of Marin County. We’re passionate about the safety of the environment, but in addition to that, we find electric cars to be really cool. If your small business is interested in providing electric car charging stations to your patrons, or are just interested in making it a home amenity, give us a call. We’re excited to add value to your business on the behalf of the environment.